Siddharth has been in the Mumbai music scene since 2011, playing guitar in bands like ‘Spud in the Box,’ ‘Gumbal,’ ‘In Memory Of,’ and many others. 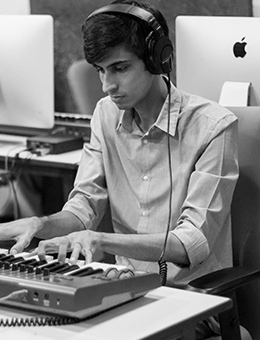 After completing a music production course at The True School of Music, he has been a music composer and producer at Horse Garden Productions with his partner Zain. Together, they have worked with many esteemed brands like Amul, TBZ, Sula, Bajaj, Housing.com etc. Their work has been featured in publications such as Rolling Stone, The Quint, DNA, NDTV, Buzzfeed and more.